Drew became involved in racing in 1988 when his father took him to Hill Valley and Path Valley Speedways to watch Jason. His pit responsibilities include being head tire engineer. Williams Grove Speedway is Drew's favorite track stating, "The racing atmosphere and the history there is incredible! There is no better place to be on a Friday night!" Between going to the races, Drew works at Fitzgerald Auto Mall in Chambersburg. He enjoys watching 410 sprint cars, playing video games, reading anything about dirt track racing ("to better my knowledge of the sport"), and racing dirt oval R/C cars. Heather's racing started with watching monster trucks at Hagerstown Speedway and then watching NASCAR. After she met Drew, he introduced her to dirt late model and sprint car racing. She helped out Motter Motorsports in 2005 and BK Motorsports from 2006 to present. Her responsibilities include helping with tires and other track-side duties. Heather says her favorite track is Hagerstown Speedway because that was where she started watching races. Then she became a team member for Jason and experienced a few wins at Hagerstown. As a result, Hagerstown Speedway is a special place for her. In her spare time, Heather enjoys reading and spending time with family and friends. She loves car shows and other related car activities. At the present time, she's learning about R/C racing. In 1988 Brandon's dad started taking him to Hill Valley and Path Valley Speedways. Brandon said, "It didn't take much to catch the racing bug, and I've been involved ever since." He helped Freyco Inc. from 2000 to 2001, Steve Motter Motorsports from 2002 to 2005, and BK Motorsports from 2006 to present. Brandon's 43A Team responsibilities include "anything that needs to be done." When asked about his favorite track he replied, "Williams Grove Speedway." He stated, "There's nothing like racing under the lights at 'The Grove' on a Friday night." 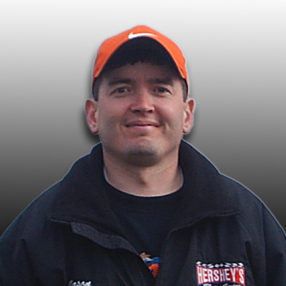 When not racing, he works at Price Motor Sales (Cassville, PA) in the parts and service department. He also enjoys video games, movies, reading racing publications, and watching 410 sprints. Brandon is looking forward to another season with the 43A team. After a very successful 2006 season he is looking forward to doing even more in 2007. Phat became involved in racing in 1998 when he helped out Jason Covert at Silver Spring Speedway. Phat has helped out a few race teams: from 1998 to 1999 - Jason Covert Racing; from 2000 to 2001 - Freyco Inc.; from 2001 to 2002 – Brad Kling Racing; from 2002 to 2003 - Motter Motorsports; and from 2006 to present – BK Motorsports. His pit responsibilities include doing anything that needs to be done. Tyler County Speedway in West Virginia is Phat's favorite track stating, "It’s racy as hell and a bullring." When Phat is not going racing he enjoys playing golf, playing the guitar and going skiing. Phat is pleased to be involved with a team of this caliber and he is looking forward to continuing working with BK Motorsports. Scott has known Bryan and Barry Klinedinst for many years and has been helping the 43A Team for a few years. His responsibilities include chassis work, body work, and routine maintenance in preparation for the next race. He became involved with racing in 1967-68 when he was acquainted with Sam and Jim Hollerbush racing while attending the local dirt tracks (Lincoln, Susquehanna, and Williams Grove). He worked for the Eater and Starz car (#61), driven by Bobby Goodling from 1973 to 1976. When he was asked what he does when he's not racing, Scott's response was, "Besides working at K.B.S. Trucking, what else is there besides racing?" Lincoln Speedway is his favorite track. He commented, "Lincoln has good banking, it's short but quick, and really shows a driver's ability". Jaynelle’s first interest in racing started as a spectator at Hesston Speedway. In 1995, after she started dating Jason, she became part of his team, and has been a part of all of Jason’s teams since that time. Jaynelle’s major responsibly is creating a master schedule at the beginning of each race season. This schedule includes dates, track information, and which series, if any, is sponsoring the race. She also completes the paperwork … payoff information and registration information at the track. Merchandise sales and inventory and making trips to dry cleaners to have Jason’s driver suites cleaned are also her responsibilities. And, on occasion, she bakes goodies, cleans the hauler, and also helps out with anything else that needs to be done. Jaynelle doesn’t have a favorite track … she says she enjoys them all! When not racing, she enjoys spending time with her family. Her responsibilities include helping clean the hauler and making goodies to take to the races. She also delivers ice cream to the shop after every win as a treat for the Team. When asked if she had a favorite track, she said she likes any track that she can get into the pits, but she especially likes going to Portsmouth Raceway Park because she can go to the Ohio River at the track and collect rocks. Her favorite pastimes are playing the piano, reading, and playing games. Allison is also 43A's backup driver.